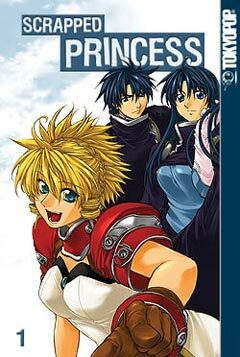 The first volume of the Scrapped Princess manga appeared around the same time as the initial volume of the anime series. However, the two are not mere carbon copies of one another. This isn’t terribly surprising, as they are both based upon the same set of novels, written by Ichiro Sakaki. They share characters, the overall plot and visual designs, but the path taken by the manga diverges somewhat from what viewers may recall seeing in the animated version. Pacifica, the titular Scrapped Princess, was the unfortunate target of a doomsday prophecy, citing her as a threat to the continued existence of civilization. On her sixteenth birthday, it was foretold that she would destroy the world. In order to avoid the dark fate that she was predicted to deliver, an order was issued to execute her and her twin brother. What the authorities didn't realize was that the assassination was not carried out successfully -– Pacifica survived. It isn't until almost sixteen years after her birth that it is discovered that she still lives. Once again, commands are given to kill the young girl in an attempt to seal her own fate before she endangers the lives of everyone else in the kingdom. Despite the terrible burden of a threatening prophecy hanging over Pacifica's head, she has two steadfast protectors dedicated to keeping her alive. While they're not related by blood, Pacifica considers them to be her siblings, and the bond between the three is as strong as any forged by love. Raquel, the magic user, is a warm-hearted, almost matronly sort of person. She has the ability to cheer up the party when despair appears amongst them, and in a fight, she is as formidable with her spells as her brother is with a sword. Shannon serves as a handy foil for Pacifica. Whereas Pacifica is carefree and exceedingly trusting, Shannon is strongly grounded in reality and puts their safety before any other concern. He's a master swordsman, although he's not too much older than Pacifica; perhaps his skill stems from the great amount of practice he's had in fending off would-be assassins targeting his charge. Thanks to the protective and supportive nature of her companions, Pacifica is, in most respects, a typical teenage girl. It's possible that the true weight of her fate is so significant that it is easier to ignore it than if it were something less catastrophic. The trio doesn't spend much time worrying about the prophecy; instead, they focus on staying alive and keeping out of sight from potential pursuers. It is apparent that there is far more meat to the plot than what is actually served to readers of the manga, which is perhaps one of the less appealing traits of this otherwise charming tale. After I saw the anime, I knew that there was more to the story than what had been revealed, but the book leaves even more to be desired in terms of fleshing out the characters and defining their motivation. There's a good story here, and if the other books in this series delve deeper into the source material, then I'm certain readers will appreciate it. As it is, given a choice between the original novels, the anime series and the manga, I'd choose the original novels. Seeing as they're not in English as of yet, I'm content with just watching the anime, produced by Bones and distributed in the US by Bandai. Scrapped Princess features appealing character designs, provided by Yukinobu Azumi, and the level of detail granted to the rendering of each protagonist is impressive. The book's art, created by Go Yabuki, is worthy of admiration, although the action scenes can be a little too busy at times. I have to admit that I like the look of the characters. For me, pretty pictures go a long way in justifying my purchase of a series. The adaptation of the work into English reads well, and the sound effects were left untouched. There isn't much omake material, but that sometimes depends on the amount available from the original edition. I don't particularly live for bonus content, although it's always nice to see it included when it exists. As a supplement to the anime series, the Scrapped Princess manga is a good buy. However, I'm not sure that I can recommend the title to those who have no intention of watching the anime version. It's hard to figure out what the point is in the first volume. Sure, Pacifica is to be assassinated, and yes, she's plucky, and her traveling companions have considerable talents... but where exactly are they going? Are they just running away? Why aren't they being more discreet? These are all rhetorical questions, and they didn't really bother me, but some readers may not be as forgiving as I am when it comes to manga. I'm sure the story will pick up eventually, but not everyone can afford to invest in a series in the hope that it will eventually get better. There are plenty of books that are good from page one out there; a slow starting series isn't always the easiest purchase to make.